First soak the rice for about 3-4 hours. And grate the coconut. Then grind the cardamom. Now wash the rice properly and then add milk and coconut to it. Then grind the mixture of rice, milk and grated coconut to form a batter. And now add sugar, baking powder, cardamom powder and salt to it and thoroughly whip the same. Now then keep the batter aside for 2 hours. Then pre-heat the frying pan with 1 tbsp ghee. And now the pan is heated put 2 tbsp of batter and spread to give the shape of the pan cake. Please cover the lead. Put the pan on low flame for about 3 minutes. 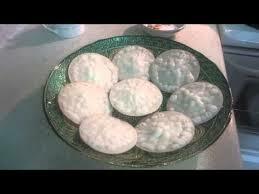 Then thereafter open the lead and take out delicious and crispy chitau pitha. And prepare pithas from rest of the batter. Finally serve this Chitau Pitha any decorated plate or bowl.